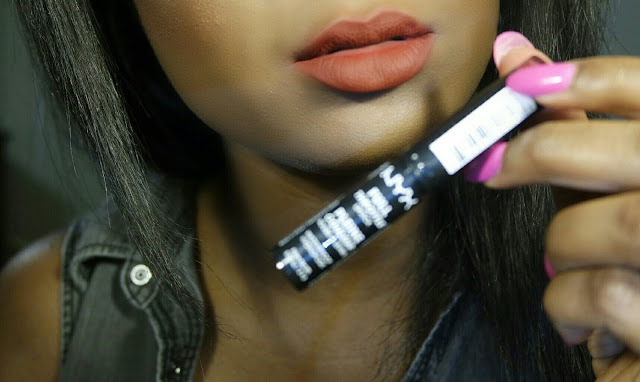 of new NYX lip products and the one that intrigued me the most was the NYX Full Throttle Lipsticks. I purchase one and have been wearing it and testing it out for a few weeks and it's all ready for review. It's the color addicts ultimate fix and a makeup artist's dream: NYX Cosmetics' waterproof Full Throttle Lipstick covers your lips with a super saturated matte color and features a unique bullet with a beveled edge for lining, filling and perfecting your pout to your heart's desire. 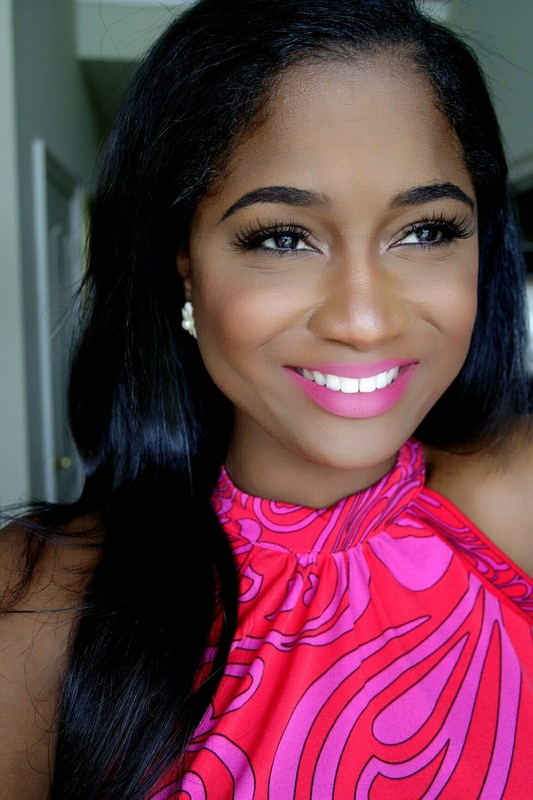 As you can see from the lip swatch from above this product applies with full opacity. I have darker pigmented lips and this covered all of it. So when I first purchase this, the swatch on my hand literaly lasted through a nap and a shower, This formula goes on creamy and sets down to waterproof matte finish. YES, its WATERPROOF!! It lasted all day. So one of the claims of this product is the unique bullet shape that is supposed to aid in application, I think that the bullet helps, but after one wear my bullet was worn down making it a regular round shaped lipstick. I think the initial concept was good, but the shape isn't going to last. Other than that, the packaging is like a skinnier version of the NYX round lipsticks. Like I said in the pigmentation section. The formula of this is actually amazing!! It goes on creamy, but after a few minutes, sets to a matte waterproof formula, that did not move all day even through drinking water. I would assume that it would come off if you ate something really greasy, but I did not (winter diet struggle life). Has anyone else tried out the Full Throttle Lipstick? Comment below if you have or want too. I've got Kiss The Dust, and I agree with all of the above, excluding the packaging. It's awkward as all hell, mine broke off without me doing any-freaking-thing to warrant itdoing that, like, it literally broke off while I was loking at it after I opened it, I hadn't even swatched the thing, it being slim does not help at all. For such a great formula, I can go along with the sh!tty packaging, but an improvement would be awesome. Yes, I agree! The more use I've gotten out of these, the more I have grown to dislike the packaging. I ended up ordering like three more colors though because I love the formula though!